McKinsey & Company released a report today analyzing the fourth industrial revolution (Industry 4.0), which pertains to the implementation of the Internet of Things (IoT) in traditional industries. To compute the effects of the fourth industrial revolution, the report, “Industry 4.0 - How to Navigate a Changing Industrial Landscape,” used exclusive market research. More specifically, the report analyzed the attitude, impact, and level of preparation for the U.S., German, and Japanese markets. The survey featured 300 respondents, all of which are employed by companies with 50 or more employees. "We invested dedicated experts and full time resources over more than four months into the research in this area," said Dominik Wee, a leader in McKinsey's Semiconductors Practice in EMEA. "This is one of the top priority investment areas for McKinsey and its Advanced Industries practice, since it will fundamentally change the business model of our industrial customers. Being thought leaders on industry-shaping trends is a top priority for us and part of our value proposition." The fourth industrial revolution will have a higher impact and require less implementation of new equipment, according to McKinsey & Company’s research. In fact, just 40 to 50 percent of the current equipment is expected to be replaced. Those figures signify an obvious advantage over the previous industrial revolution (industrial automation), which had an 80 to 90 percent rate of replacement. "A significant amount of the value will come from upgrading existing systems to ensure interconnectivity for data collection, analysis and executing commands, e.g., by retrofitting sensors or even without changing the hardware, just by adding additional intelligence and interoperability in the software, assuming the electronics hardware capabilities (processing power and speed, storage/memory functionality) and actuation devices are sufficient or can be upgraded," said Hans-Werner Kaas, senior partner and head of the McKinsey Automotive & Assembly practice. According to the report, “Industry 4.0 is enabled by disruptive digital technologies that are expected to change the manufacturing sector by 2025 through significant innovation.” The report identifies those technologies as data, computational power, and connectivity; analytics and intelligence; augmented reality; and 3D printing. Among Industry 4.0’s biggest winners are global companies. The report reasons that expected success of global companies will result from labor effectiveness, which is “driven by digitization of knowledge work, quality by advanced analytics, and development time by touch operation/interfaces.” The report also suggests that digital enablement of processes gives way to high quality information gathering, the prompt processing of information and data, and the opening of commands for enhancements. "Next to global companies, it will also benefit startup companies in the industrial space or small or medium-sized companies with the respective capabilities, that are driving the underlying technologies, advanced analytics and software solutions of Industry 4.0," Wee said. The report predicts that there will be a 30-55 percent drop in knowledge work (healthcare, IT, legal, finance) between 2010 and 2020. Though Kaas said the transition to Industry 4.0 has already started, he claims the revolution won't go into full swing overnight due to the longer innovation cycles in industrial contexts. Kaas added, "But we are already seeing examples of companies that are successfully piloting individual Industry 4.0 technologies such as 3D-printing or digital enabled manufacturing control, in some cases extended to their supply base." Scottsdale, AZ – April 14, 2015 – The Platform Industrie 4.0 (I4.0) announced at Hannover Messe 2015 a reference architecture model for Industrie 4.0 (RAMI 4.0). RAMI 4.0 is a unified architecture model that serves the purpose of a common understanding, which standards, use-cases, standards etc. for I4.0 are necessary, and allows discussing associations and details. In RAMI 4.0 I4.0 components are defined in their structure and functioning. Thus it enables cross-company networking and integration across value added networks. Where meaningful, RAMI 4.0 builds on existing and relevant standards. The Platform Industrie 4.0 trade organizations BITKOM (IT), VDMA (Mechanical Engineering) and ZVEI (Electronics) together collected and analyzed necessary or relevant standards for RAMI 4.0 in technically oriented working groups. In the category “Communication Layer” the OPC UA (IEC 62541) standard was thoroughly examined if adequate for RAMI 4.0 and as one and only confirmed. In other categories this was the case for: “Information Layer” IEC Common Data Dictionary (IEC 61360Series/ISO13584-42), Characteristics, Classification and Tools according to eCl@ss, Electronic Device Description (EDD) and Field Device Tool (FDT); for “Functional and Information Layer” Field Device Integration (FDI) as integration technology; and for the category “Consistent Engineering” AutomationML, ProSTEP iViP and eCl@ss. “Companies like ThyssenKrupp are implementing Industrie 4.0 today. The availability of established communication protocols is mission critical for such a timely implementation; OPC-UA is here the best example!”, said Dr Achatz head of technology at ThyssenKrupp AG. “In RAMI 4.0 diverse aspects of a common model were brought together. Starting from vertical integration via consistency of engineering across the entire lifecycle to horizontal integration. For each of these areas OPC UA offers an essential contribution”, according to Stefan Hoppe, VP OPC Foundation. “In addition the powerful OPC UA modelling tool will play an important role for the area of semantics where machines, components and products need to be interpreted and understood by humans, software /-agents and -services. The OPC UA modelling capability has been a major reason for FDI and AutomationML as independent standards to choose to have their contents (the “what”) communicated on the basis of OPC UA (the “how”)”. Since 1996, the OPC Foundation has facilitated the development and adoption of the OPC information exchange standards. As both advocate and custodian of these specifications, the Foundation’s mission is to help industry vendors, end-users, and software developers maintain interoperability in their manufacturing and automation assets. The OPC Foundation is dedicated to providing the best specifications, technology, process and certification to achieve multivendor, multiplatform, secure, reliable interoperability in industrial automation and related domains. The organization serves over 440 members worldwide in the Industrial Automation, IT, IoT, Building Automation, Oil & Gas and Smart Energy sectors. For more information about the OPC Foundation, please visit https://opcfoundation.org. Dit artikel is verschenen in PT Industrieel Management en werd geschreven door Evi Husson. Contacteer de 3IF.be proeftuin voor een setup van een Industrie 4.0 Predictice Maintenance Case. Download het volledige PwC rapport van Juni 2017. Waar staan bedrijven momenteel op het gebied van voorspellend onderhoud en waar denken ze in de nabije toekomst te staan? Hoe kom je stapsgewijs tot voorspellend onderhoud? Marktonderzoekers PwC en Mainnovation deden afgelopen jaar onderzoek onder 280 bedrijven uit België, Nederland en Duitsland. De resultaten zijn in het rapport Predictive Maintenance 4.0, Predict the unpredictable gepubliceerd. Uit het onderzoek blijkt dat tweederde van de respondenten nog steeds op volwassenheidsniveau een of twee zit. Slechts elf procent heeft niveau vier al bereikt. De data die de respondenten gebruiken om aan voorspellend onderhoud doen, komen van de onderhoudshistorie (73%), het gebruik van de assets (72%) en de conditie van de assets (71%) en worden in de meeste gevallen (67% ) verzameld en verwerkt met MS Excel en MS Access. In 79 procent van de gevallen is de technicus betrokken bij het onderhoud en slechts in 8 procent van de gevallen is een data-analist of specialist betrokken. Deze cijfers wijzen op niveau twee van volwassenheid. Ingrediënten voor niveau vier zijn environmental data, statistical software en data scientist, aldus het rapport. Waarom is voorspellend onderhoud zo belangrijk? De wil om een niveau hoger te komen, is er zeker. De respondenten zijn erg ambitieus om hun niveau in voorspellend onderhoud te verbeteren. Ongeveer één op de drie bedrijven verwacht binnen een periode van vijf jaar voorspellend onderhoud in een of andere vorm te gebruiken, op voorwaarde dat ze het succesvol kunnen implementeren. Het verbeteren van de uptime is voor de deelnemers aan het onderzoek één van de belangrijkste redenen (47%), gevolgd door kostenreductie (17%) en levensduurverlenging van de assets (16%). Andere beweegredenen die in mindere mate een rol spelen zijn een verlaging van HSE-risico’s, een hogere klanttevredenheid, een nieuw productontwerp en nieuwe inkomsten, komt naar voren in het onderzoek. Wat is nodig voor een succesvolle implementatie ? Om het hoogste niveau van onderhoud te realiseren, zijn er twee aspecten van groot belang: de technologie en de organisatie. ‘De funderingen moeten goed zijn’, zegt Reyntjens. ‘Binnen het bedrijf moeten machines geschikt zijn voor Internet of Things en er moet een organisatie aanwezig zijn die continu met maintenance bezig is. Dit lijkt logisch, maar nog niet ieder bedrijf heeft deze structuur. Daarnaast moet het bedrijf beseffen dat het implementeren van PdM 4.0 een impact heeft op het hele bedrijf. Daarom is het van belang om klein en stapsgewijs te beginnen.’ PwC en Mainnovation hebben een plan met zeven stappen opgesteld om PdM 4.0 te implementeren. 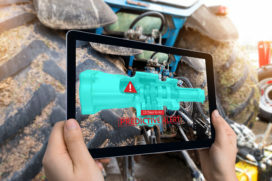 Om Predictive Maintenance 4.0 (PdM 4.0) te kunnen implementeren, zijn een aantal randvoorwaarden van belang. Zo moet er een big data infrastructuur aanwezig zijn die elke opeenvolgende stap ondersteunt. Bedrijven moeten overwegen welke data zij willen verzamelen van zowel externe als interne bronnen en op welke manier ze deze data willen verzamelen (bijvoorbeeld via de cloud of intern). Toegang tot de data is belangrijk en kan implicaties hebben op de snelheid, betrouwbaarheid en bandbreedte van het communicatienetwerk. Daarnaast is ook een Internet of Things infrastructuur vereist, wat betekent dat de assetsen het (onderhouds) data center draadloos met elkaar moeten zijn verbonden. Het maakt het verzamelen en distribueren van sensordata mogelijk. De juiste IoT-infrastructuur voor het bedrijf opzetten, impliceert het kiezen voor een geschikt protocol, draadloze verbindingen, data-encryptie en een bepaald veiligheidsniveau. Ook de keuze van het data-analyseplatform is een belangrijke beslissing voor het bedrijf, om te komen tot een geïntegreerde oplossing. Niet alle bestaande ERP-systemen zijn bijvoorbeeld geschikt om geavanceerde datatrends, analyses en algoritmes uit te voeren. Een derde randvoorwaarde is het installeren van feedback loops. Dit is niet alleen een technische aangelegenheid. Het is een essentiële stap om het model op één lijn te houden met de business doelen. Het algoritme dat aan de basis ligt van PdM 4.0 kan zelflerend zijn, wat betekent dat zijn voorspellend vermogen geleidelijk aan zal toenemen, wanneer meer data worden gebruikt. Echter, als het model is geoptimaliseerd, moeten ook lessen worden getrokken over de algemene aanpak. Het algoritme kan mogelijk nieuwe storingen aan het licht brengen of nieuwe inzichten verschaffen in de betrouwbaarheid van de assets. Misschien is het nodig om de business case voor een bepaald type assets opnieuw te evalueren. Het kan duurder zijn of minder rendement opleveren dan aanvankelijk gedacht. Of het belang van de asset kan in de loop van de tijd veranderen waardoor een nieuwe haalbaarheidsstudie noodzakelijk is. CBInsights volgt verschillende markten en technologieën vanuit een investeerdersperspectief. Een uniek perspectief van verschillende ontwikkelingen op wereldschaal van technologie-startups en bedrijven om te volgen. Deze bedrijven vormen de basis voor het transformeren van : productiebedrijven, olievelden en aanvoer. So far, the IIoT wave transforming asset-heavy industries has been led by the old guard of tech giants such as GE, IBM, and Cisco.. Note: While some companies may fit into multiple categories and parts of the stack, we mapped companies based on their primary use-case. 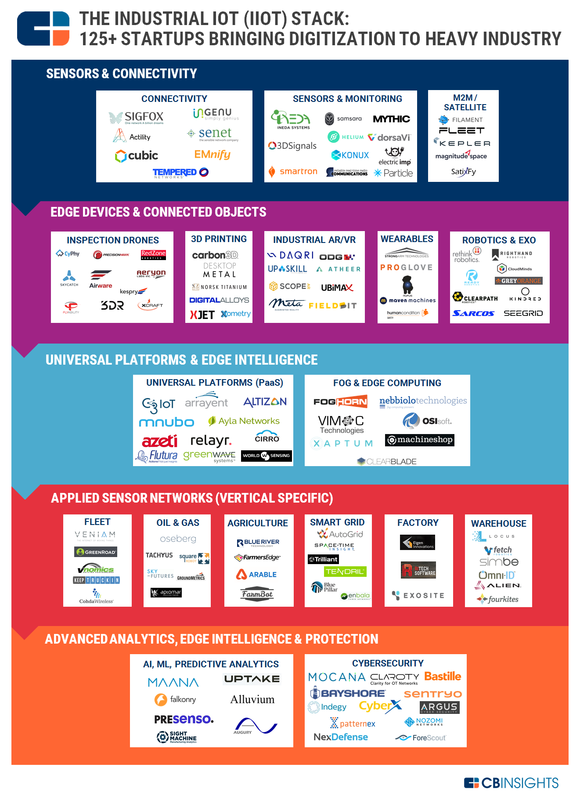 This market map is not meant to be exhaustive of companies in the space. Many organizations no longer view cybersecurity as a barrier to change, nor as an IT cost. That’s the word from the Global State of Information Security Survey 2017 from PwC US, which found that there is a distinct shift in how organizations view cybersecurity, with forward-thinking organizations understanding that an investment in cybersecurity and privacy solutions can facilitate business growth and foster innovation. According to the survey, 59% of respondents said they have increased cybersecurity spending as a result of digitization of their business ecosystem. In this process, organizations not only create products, but also deliver complementary software-based services for products that extend opportunities for customer engagement and growth. Survey results also found that as trust in cloud models deepens, organizations are running more sensitive business functions on the cloud. Today, the majority of organizations around the world—63% of survey respondents—say they run IT services in the cloud. Additionally, approximately one-third of organizations were found to entrust finance and operations to cloud providers, reflecting the growing trust in cloud models. According to survey respondents, organizations are also embracing both managed security services and open-source software to enhance cybersecurity capabilities, signaling that businesses are making cybersecurity a priority despite many not having the necessary in-house capabilities and an overall lack in talent to fill key positions. More than half (53%) of respondents employ open-source software and 62% of respondents say they use managed security services for cybersecurity and privacy—relying on managed security services for highly technical initiatives such as authentication, data loss prevention and identity management. "Designing and implementing a cybersecurity and privacy program is challenging enough, but once a program is in place components must be thoroughly integrated, professionally managed and continuously improved. As this can be difficult for resource-constrained organizations, many are adopting managed security services and utilizing open-source software,” said Bob Bragdon, SVP/publisher of CSO. Momenteel vinden verschillende ontwikkelingen in Industrial Internet of Things (IIoT) en Industrie 4.0 vinden plaats, waaruit we een aantal voorspellingen kunnen afleiden. Het is een interessante mix van strategie en technologie die duiden op het voor verschillende disruptieve transformaties bij manufacturen. Digital Transformation , het samengebalde Industrie 4.0, Industrial IoT en Industrial Internet Digital Transformation lijkt momenteel de meest centrale benaming om aan te geven wat er gebeurt bij industriële bedrijven om IIoT, Industrie 4.0 of Industrial Internet technologie te duiden. Die drie benamingen op zich beperken immers het beeld grotendeels tot een stuk technologie, of industrie-gedreven ontwikkelingen soms vooral netwerk georiënteerd. Industrie 4.0 en Smart Manufacturing passen wat beter maar geven onvoldoende aan wat er verschillend is, en zijn te specifiek omdat ze gebaseerd zijn op overheidsprogramma’s die staan voor een specifieke reeks van definities en activiteiten. Digital Transformation sluit beter aan omdat het aangeeft dat manufacturen niet meer in staat zijn om hun bedrijven te laten lopen op basis van oude technologie, processen, en bedrijfsmodellen; dat dingen moeten veranderen zonder dat ze zelf weten waar ze moeten beginnen. De kracht van IIoT, Smart Manufacturing en I4.0 is fundamenteel over het toepassen van de mogelijke kracht van nieuwe technologie om positieve veranderingen mogelijk te maken, vandaar Digital Transformation. De enige beperking hierbij is het verlies van de term internet, die nochtans de basis is voor verschillende van de krachten waar de Digital Transformation voor staat, zoals ondermeer het gebruik van standaard technologie, de kracht van Cloud diensten en mobiliteit. Klantgerichtheid staat centraal. Manufacturen proberen de loyaliteit van hun klanten te bekomen. Doordat het minder duur wordt om sensoren en microchips toe te voegen aan producten om hen slim en geconnecteerd te maken, kunnen fabrikanten van machinemateriaal meer te weten komen over hoe de eindgebruikers ze gebruiken met inbegrip van producten in de fabriek die commoditie zijn. Het helpt hen hun producten sneller te ontwikkelen, sneller mogelijke fouten te herstellen en producten nauwer te laten aansluiten bij de individuele behoeften van de kopers. Bedrijven zoals Tesla gebruiken sensoren om het verkeer te monitoren en om te evalueren hoe de motoren werken zodat diagnoses kunnen gesteld worden om mogelijke problemen te vermijden. IIoT stelt manufacturen in staat om met een first mover advantage zowel staat van dienst monitoring/beschikbaarheid en operationele data te bekomen om op die manier het ontwerp van het product te verbeteren. Platformen en standaarden. Leveranciers van verschillende aard en soort, die samenwerken in verschillende organisaties proberen de kracht van platformen aan te tonen in 2016. Door de hoeveelheid van verschillende soft- en hardware platformen zullen verschillende productiebedrijven zich blijvend vragen stellen: software platformen, hardware, infrastructuur, connectiviteit, IoT, embedded computing, communicatie, analytics, ontwikkel-platformen, en nog vele andere variëteiten van platformen. Vooraleer er duidelijkheid in komt zal dit eerst nog wat aanscherpen vanuit verschillende hoeken. Onderzoeken van verschillende marktanalisten of systeemintegratoren zijn beschikbaar om bij die keuze te kunnen helpen. Schakel externe expertise in om het productieproces te verbeteren. Productiemanagers, eigenaars van fabrieken zullen kunnen vaststellen dat technologieleveranciers in toenemende mate beschikken over kennis en expertise van bepaalde onderdelen van de fabriek, die ze als dienst goedkoper en met een grotere efficiëntie kunnen leveren, dan dat ze dat met hun eigen middelen zouden kunnen doen. Oplossingenleveranciers zullen immers in toenemende mate gebruik maken van clouddiensten en voorspelbare gegevensanalyse gevoed door conventionele en onconventionele gegevens om processen en onderhoudskosten te optimaliseren. De kennis, het talent en mogelijkheden om controlepompen, wisselaars en ander fabrieksmateriaal te ondersteunen zal veranderen van eigen personeel of contractanten naar het inschakelen van dienstverlening op afstand. Zo’n wijziging zal ook de bezorgdheid van manufacturen over het verdwijnen van gekwalificeerde medewerkers sterk verminderen. Referentie-architecturen. Standaarden en referentie-architecturen zijn in een omgeving waar nog veel onduidelijkheid bestaat veel gevraagd. Referentie-architecturen zullen worden gezocht in het komende jaar, en de convergentie tussen IT en OT versterken. Supply Chain verbetering. Steeds meer IIoT toepassingen zullen bedrijven helpen met het beheren van hun end-to-end supply chain. Verbeterde opvolging en real-time meldingen, maar ook verbeteringen op basis van voorspellende gegevensanalyses. IoT zou kunnen gebruikt worden om een meer geautomatiseerde bestelling te laten doorgaan, inclusief logistiek en handelspartners, op basis van scenarios met een voorspelbaar onderhoud, die onmiddellijk kan worden afgerekend. Ondanks verschillende technische ontwikkelingen blijft de beveiliging van de de toestellen en toepassingen een belangrijke uitdaging. Niet in het minste omdat een heleboel componenten geïntegreerd moeten worden, of toepassingen verbinding moeten zoeken buiten (het netwerk van) organisatie, buiten de traditionele perimeter. Anders zou het afbreuk kunnen doen aan de performantie of continuïteit van de uiteindelijke oplossingen. Meer bescherming voor toestellen aan de buitengrenzen. Toestellen die zich bevinden aan, of net buiten de grenzen van het bedrijfsnetwerk en dus niet altijd onder de controle vallen van de bestaande structuren van de organisatie zijn dan ook een uitdaging. Het zijn toestellen die rechtstreeks met internet of buitennetwerken verbonden worden. Net zoals een traditionele modem en firewall, moeten ze zelf voldoende beschermd worden. Er wordt van verwacht dat ze een langere levensduur te hebben dan traditionele toestellen, bijvoorbeeld omdat ze minder vaak aangepast kunnen worden. Het is immers soms vrijwel onmogelijk om bestaande installaties te vervangen, te patchen of te updaten, zonder daarbij hoge kosten te verwachten. Om de toestellen te beveiligen, wordt bescherming en controle vanuit het netwerk waaraan ze gekoppeld zijn verwacht. Sommige toestellen zullen zich op locaties bevinden die ook fysiek onvoldoende beveiligd kunnen worden. Vanaf 2016 zullen nieuwe netwerk technologieën zoals Software Defined Networking en Netwerk Functie Virtualisatie (NFV) commercieel beschikbaar worden bij een aantal operatoren. Die nieuwe diensten kunnen een betere bescherming van grenstoestellen inhouden. Het maakt verschil! Een toenemend aantal controle ingenieurs zal uiteindelijk kunnen begrijpen waarom het potentieel van digitale transformaties op basis IIoT/I4.0 verschilt van wat ze gedaan hebben met SCADA en automatisatie in de laatste 30 jaar. Meer integratie op bedrijfsniveau zal mogelijk worden door het toepassen van slimme toepassingen en nieuwe manieren van bedrijfsbeheer. De ingenieurs zullen de connectiviteit en controlemogelijkheden van IoT erkennen, maar toepassingen, schaalbaarheid, analytics en de mogelijkheid om bedrijfsprocessen opnieuw uit te vinden, zullen de een verandering in gedrag kunnen teweeg brengen en de digital transformatie mogelijk maken. Dit artikel werd geschreven op basis van een eerdere analyse van Greg Gorbach (industrial-iot.com) (ARC) EN ANDERE BRONNEN. Technologie-analyst Gartner, bekend van de vendor-analyses in specifieke domeinen, publiceerde eind februari 2016 een overzicht van de top 10 uitdagingen voor IoT voor de komende 2 jaren. Die zijn niet alleen van toepassing bij bedrijven die momenteel aan het evalueren zijn wat de mogelijkheden voor IoT zijn, maar eveneens van toepassing voor Industrie 4.0 en Industrial Internet, die eveneens gebruik zullen maken van soortgelijke toestellen. ze het aantal connecties die in een wide-area IoT netwerk voorzien (zoals Lora, GSM 4 - 5G), sterk overstijgen. Dat zal zeker ook het geval zijn voor productiebedrijven, maar de toepassingen zoals auto's die worden gemaakt door de manufacturen zullen wellicht beide moeten voorzien. hardware en software ontwikkelingen zullen van IoT security een snel evoluerend domein maken tot 2021. Het gebrek aan kennis en kunde vandaag, zal alleen maar toenemen en versnellen. Bedrijven kunnen beter vandaag beginnen investeren in het ontwikkelen van in-house expertse en aanwervingen beginnen. Verschillende security probelemen zijn het resultaat van een zwak ontwerp, slechte implementatie en een gebrek aan opleiding. IoT Processoren, low-end 8-bit microcontrollers IoT zullen domineren tot 2019, 32-bit microcontrollers vanaf 2020 zullen overnemen. Interessant is dat 16- bit processoren nooit echt zullen doorbreken in IoT toepassingen volgens Gartner, hoewel een heleboel toepassingen vandaag nog steeds hier op toegepast worden. IoT besturingssystemen, minimaal en met een kleine footprint moeten zijn om momentum in IoT naar 2020 te kunnen krijgen. Windows en iOS worden verwacht te complex te zijn, en te intensief in resources voor het merendeel van IoT toepassingen. Voor uitzondering- en event-gedreven taken kan dat inderdaad kloppen. Moeilijker wordt het wanneer er meer aan multithreading moet worden gedaan, of om specifieke eigenschappen zoals beveiliging en controlesystemen toe te staan. we meer en meer Event Stream Processing zien in IoT applicaties. Die zullen extremeem hoge data rates vereisen. Die moeten geanalyseerd worden in real time. Sommige systemen genereren tienduizenden events per seconde, sommige elektronische transacties soms miljoenen. Om daaraan tegemoet te komen moeten distributed stream computing platforms (DSCPs) verder worden ontwikkeld. IoT Platformen meer en meer infrastructuur componenten bundelen in één product. Diensten van zo'n platformen zouden moeten bestaan uit low-level device control, communicatie, device monitoring and management, beveiliging en firmware updates. Daarnaast moeten platformen ook IoT data acquisition, transformatie en management van gegevens; en IoT application development, mogelijk maken waaronder event-driven logica, toepassingen programmeren, visualisering, analytics en integratie-adapters voor enterprise systems (ERP en MES). Ben je Gartner klant- of partner, dan kan je het gedetailleerde rapport opvragen "Top 10 IoT Technologies for 2017 and 2018." This report is part of the Gartner Special Report "The Internet of Things", which looks at the necessary steps to building and rolling out an IoT strategy. Symantec vond een aggressieve cyber security bedreiging tegen productiebedrijven, genaamd Duuzer. De gesofistikeerde malware is specifiek gericht naar manufacturen, om hun systemen stil te leggen. Verwacht wordt dat via een email een virus wordt opgestart en verspreid, dat vervolgens een trojaans paard exploiteert in het bedrijfsnetwerk. Die neemt verbinding met de hackers zodat de machines die zich in het netwerk bevinden van binnenuit kunnen worden aangevallen. The Duuzer attackers have been observed trying to disguise their malware on an infected computer. They do this by identifying what software is installed and runs on startup, then renaming their malware to a similar title of an existing, legitimate program. Er is nog geen rapportering dat deze malware ook Vlaamse, Belgische of Europese bedrijven zou bedreigen, maar die kans is gezien de sofistikatie van de malware zeer reëel. Symantec geeft in hetzelfde artikel ook advies, met welke technologie de aanval is ontdekt en hoe de omgeving kan worden beschermd tegen bijkomende aanvallen.